Conversational UI is simply a chatbot experience that processes language in a natural way as if you were texting or speaking with another human being. A typical experience with technology, this included computers, websites and mobile apps, is conducted in a way that requires people to click on different icons or links in order to get the computer to do anything. It’s neither natural nor human-like communication, even if by now we are pretty used to it and expect it. Conversational UI makes the switch to a human form of communication as if a human were to have a normal conversation with another person. Currently, the two popular ways of engaging with conversational UI is through actual speech, think Amazon’s Alexa or through chatting and typing with a chatbot, think Facebook’s Messenger. We’ll focus on the latter type in this post. Why are conversational UIs a good idea? Simply put, people are a lot better at talking with one another than using technology. It’s natural and innate. When speaking with a friend or a stranger we can easily correct ourselves if we say something confusing or misspeak. I’ve mentioned before that people are used to interacting with technology in its more native way through clicking or tapping. However, as we all know, there are many instances where an experience is confusing for example when users make errors when a form field isn’t specific enough, or when people can’t find what they are looking for easily in an app. A lot goes into user testing to make sure a feature, an interaction or a website is easy to use. Conversational UI shouldn’t deprecate user testing but the experiences for users and people, in general, should be a whole lot easier by default. (User testing would just be different.) After all, technology should evolve to suit us, the users. 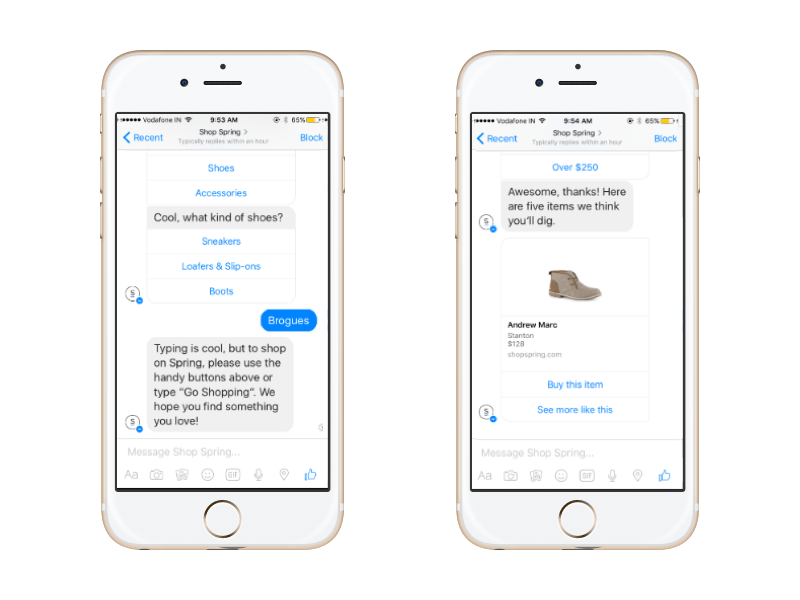 A while back, Facebook integrated a chatbot API into Messenger which permitted Messenger users to interact with businesses on a whole new level through conversational UI. You aren’t speaking directly with the employees at the business – sometimes yes but not always – yet that’s what it feels like, that’s the experience. Yet, through a simple and easy conversation, you’re now able to retrieve an information about an upcoming flight like with the KLM chatbot, ask CNN about the latest news both general or on a specific topic, or receive personalized gift recommendation after answer some questions with the Nordstrom chatbot. Let’s talk about Nordstrom a little bit. It’s important to note the opportunity for Nordstrom with its chatbot. As more and more people become heavy mobile users, it’s a great business idea to provide a more seamless experience of shopping online with one’s phone. 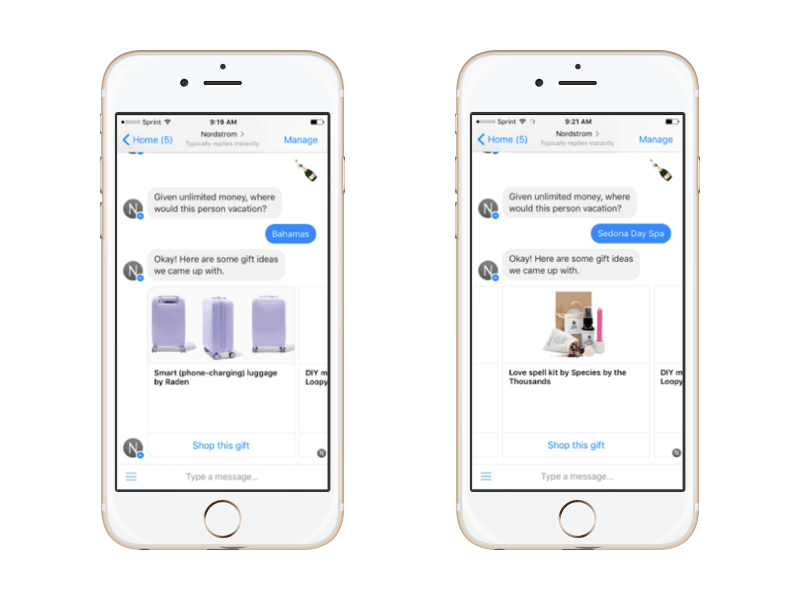 Nordstrom saw the opportunity back in 2016 and launched a chatbot that helps you find gift ideas for your holiday shopping. It’s an amazing commerce opportunity and an amazing customer experience right where the customer is having out, their Messenger app. Since Nordstrom’s big success other commerce and eCommerce companies followed suit. You can easily chat with Tommy Hilfiger, Everyone, Spring, Fynd’s Fify, Uniqlo, 1-800-flowers, Burberry and even eBay. Although not all commerce chatbots allow for browsing and shopping, you can still access relevant information such a tracking an order. This is a much easier experience when you can just ask “where is my order” instead of sifting through your inbox or to login into the specific website’s account. Slack is renowned for its chatbots, or more specifically, Slackbots. The app comes with its own bot which you can easily interact with. You can integrate different apps with Slack, such as Google Calendar or Hangouts, Maker, Intro, Giphy, or Statbot which integrates with other apps such as Google Analytics, New Relic or Mixpanel. Then when talking to Slackbot can get you the necessary information or gif needed as requested. Slack has revolutionized the way teams and companies go about their daily work. It makes information easily accessible from a multitude of sources just by asking for it. This in itself is incredibly amazing. But companies can make their own bots and integrate them into the team’s slack account or enable other bots into their account. Take for instance Taco Bell’s Tacobot. It comes with the quirk you’d expect from Taco Bell while you place an order. If you noticed, this article talks more about the user experience instead of user interfaces. That’s because conversational UI is about the user experience. The term conversation UI is misleading. Facebook Messenger and Slack have their own UI – there is nothing you can do about it but design the interactions and conversations the chatbots will have with the users and customers. However, I have a great example of an independent app, Digit, which integrate their own visual design ?. This is mostly to give you non-Facebook and non-Slack examples of conversational UI in use. Let me warn you though, it’s just like designing a peer-to-peer chat interface. For those of you who haven’t heard of Digit, which I highly recommend, it’s a savings app. You can do all sorts of things with the app such as pay a bill, check account balances, withdraw, save, make recurring transfers and so on. You can interact with the Digit bot in two ways. The first is in the app. The main screen of the app is the chatbot interface but you can do a few other things there like account and setting interactions outside of the bot. Although, the bot can help you with those too if you chose to speak with it. The bot is very well done as sometimes instead of a keyboard you get a set of options you can choose from. 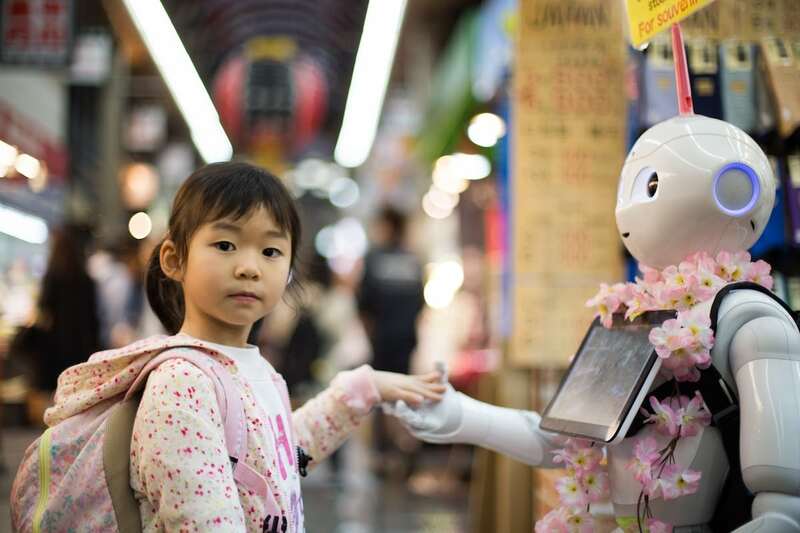 It helps with the user experience because it teaches the users about unknown possible points of conversation and it makes interacting with the bot specific instead of ambiguous. 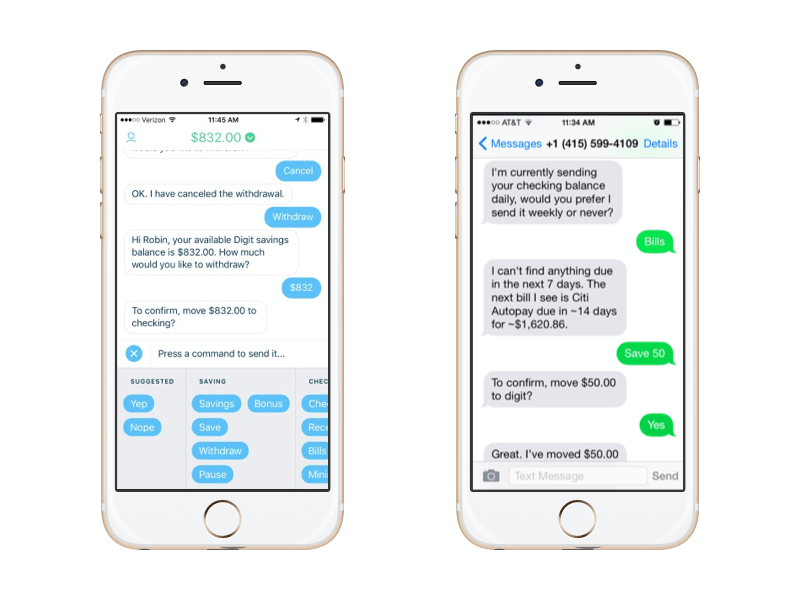 The second way you can interact with Digit’s bot is through texting its number. The conversations can be exactly the same but it can be more ambitious if you don’t know all its conversational abilities. This is great in two ways, first the use of conversation UI provides a new and ultimate easier interaction for Digit users. Because Digit allows the interaction to be both in the app and through texting, you can interact with the app in a way that’s more comfortable for you. Like I stated in this article before, the goal of conversational UI is to provide an easier, more natural way to use an app, a service or to go about your tasks. Digit is a really good example of taking conversation UI to the next level. Conversational UI is not something most people think of when it comes to user interfaces. At its core, conversational UI is about making technology behave and interact more like we interact with one another. It’s a push towards easier technology. It’s also becoming a more popular and trendy way to integrate interactions. I’m not surprised, as it provides many opportunities for business as well as better experiences for their customers.